Hello everyone! I hope you all had a great weekend. I’ve been busy as a bee working on some new stuff that I can’t wait to share with all of you. Aside from the Holiday Planner printables, I’ve also been working on some other goodies and surprises that I can’t wait to share with you. I finally have the autumn decorations taken down, and I’m itching to start digging through the Christmas stuff, but I’m being really good. I can wait until December… I hope! To help take my mind off Christmas decorating and how many more days I have to wait to start decking the halls, I decided to turn my attention to some holiday stuff that I could get going on soon: the Holiday Baking. Before just jumping in and baking up a storm I thought I’d take some time to make a plan, and you know what that means right? 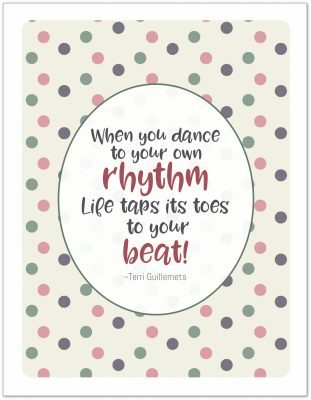 More free printables to share with all of you! This year I’m trying something new. Our Teen is taking Foods class again this year, and I plan to let him do most of the baking. Gasp! Yep, I’m a little nervous about that, but I figure if I could give up my role as turkey cooker, as I did last Thanksgiving, then I can share the baking role. 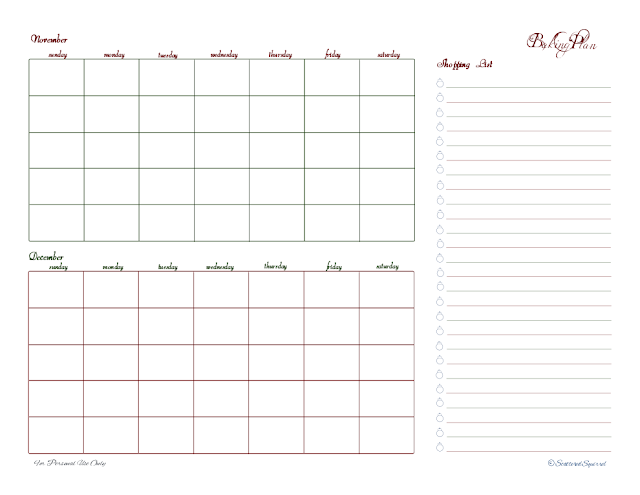 To help us coordinate and plan our baking sessions I created a few printables to help us out. 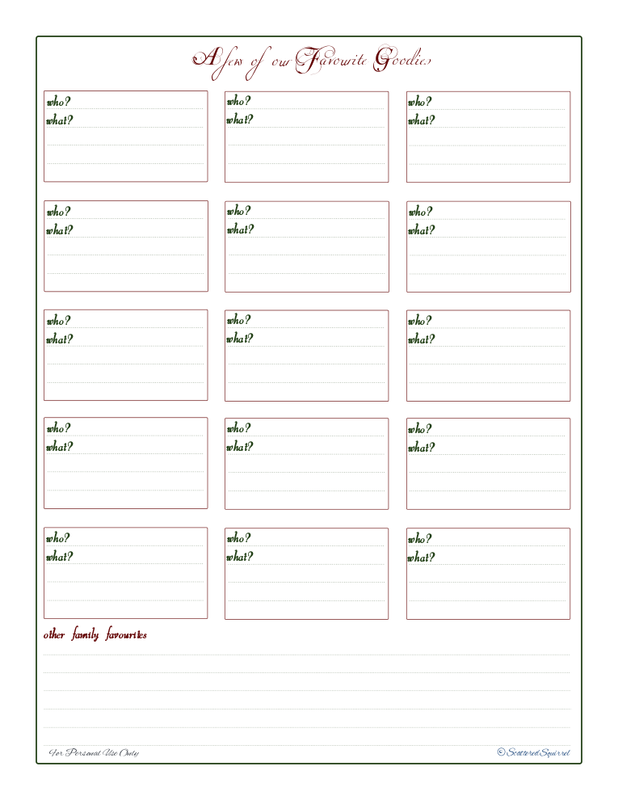 The first planner page is to keep track of what we’re planning to make, how many batches, will/can they be frozen (in other words, made ahead of time) and also to help us keep track of whether or not we’re making them for a party or as a gift. Having a list of recipes we’re making, or wanting to make, and where to find the recipe is going to save us a ton of time. Next, we need to find the time to do the baking, and we need to make sure we have what we need. This is where the Baking Plan will come in really handy. 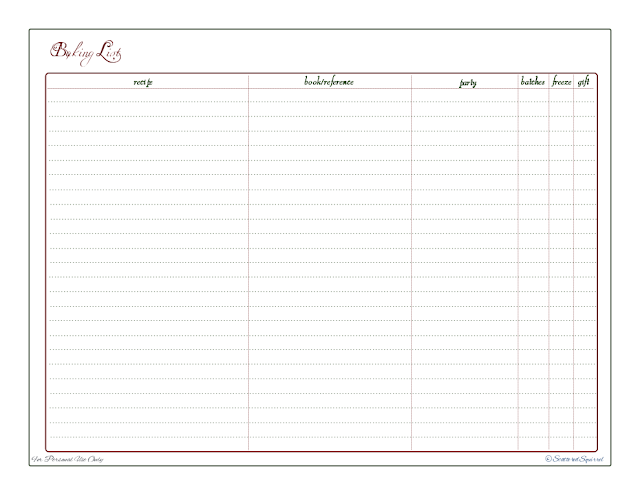 With this I can keep track of who’s baking on what day. That way we both have a chance to have some fun in the kitchen, without stepping on each other’s toes. I added the shopping list on the side so we can note down anything we need to pick up, or run out of as we bake up a storm. Normally we don’t start our baking until mid-November, but I thought that maybe some of you might start at the beginning of the month, if not earlier. I left the calendars undated so that they could be used year after year. The last printable I have for you is for something new I want to try. Everyone has their favourite holiday goody; that cookie or square, or other treat that they look forward to every year. I really wanted a way to keep track of that. One of these years I want to make up a huge basket of goodies for my nearest and dearest, and I really want to make sure that everyone gets something that they really enjoy at holiday time. This one is pretty simple, every person gets a box where I can keep track of who likes what. I also included a spot at the bottom for those goodies that don’t make the individual favourites list, but everyone still enjoys. 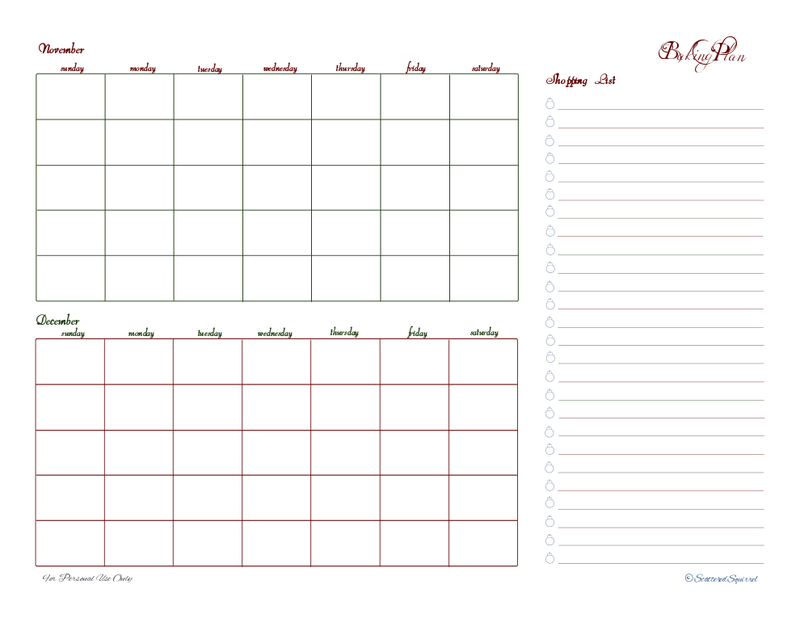 My plan for these three printables is to use them together year after year to plan out our baking. The Family Favourites will be the driving force behind the Baking List. The Baking List will hold all the info needed to plan when to bake what, and how much. 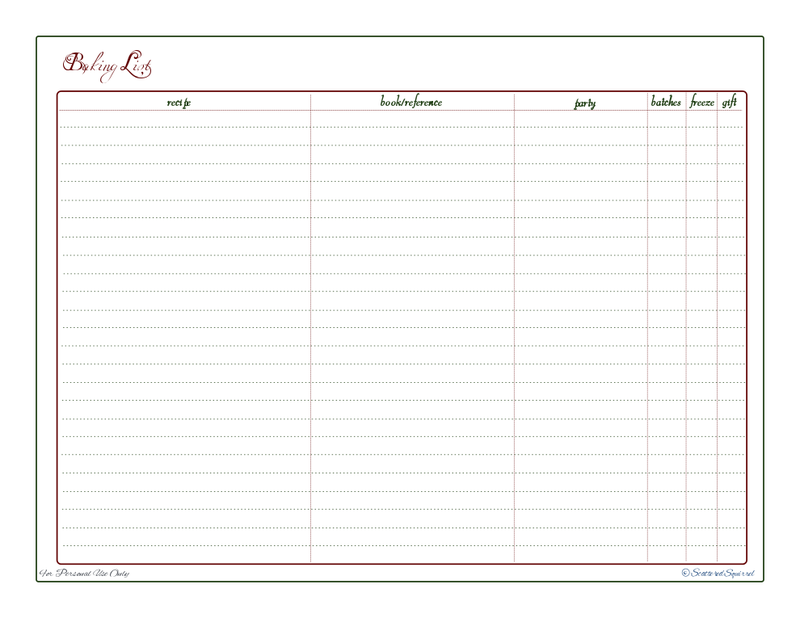 And the Baking Plan will help us stay on track, and hopefully the shopping list on it will help keep us from running out of the ingredients that we need. So, what do we need to plan for next? We’ve covered Greeting Cards, Gift Giving, and now Baking. What does that leave? I know I have a few more things up my sleeve, but what do you think? Is there something that you plan for every year? Anything you want to plan for this year? I really hope that you find these helpful. As always, just click the captions to snag a copy of your own. Do you have a favourite holiday goody that you look forward to having year after year?